We’d love your help. Let us know what’s wrong with this preview of Stand Up and Sing! by Susanna Reich. Pete Seeger was born with music in his bones. Coming of age during the Great Depression, Pete saw poverty and adversity that would forever s Inspired by the rhythms of American folk music, this moving account of Pete Seeger's life celebrates his legacy, showing kids of every generation that no cause is too small and no obstacle too large if, together, you stand up and sing! To ask other readers questions about Stand Up and Sing!, please sign up. Be the first to ask a question about Stand Up and Sing! I came to this book as a huge Pete Seeger fan. I can’t count the number of times I saw him perform. The first time I was a young child, maybe 5 or 6 years old and my mother brought me to see him perform at U.C. Berkeley. He was singing for young kids like me. I saw him at many venues in the San Francisco Bay Area, including at least 3 times at the free summer Stern Grove Festival. I adore the man and I adore the music and the activism behind much of it. I also love his silly and otherwise humoro I came to this book as a huge Pete Seeger fan. I can’t count the number of times I saw him perform. The first time I was a young child, maybe 5 or 6 years old and my mother brought me to see him perform at U.C. Berkeley. He was singing for young kids like me. I saw him at many venues in the San Francisco Bay Area, including at least 3 times at the free summer Stern Grove Festival. I adore the man and I adore the music and the activism behind much of it. I also love his silly and otherwise humorous songs. I did learn some things about Pete from this book and I want to read more. Because of the length of the text here, so much about Pete’s life was not covered, even though it’s a very text heavy picture book. Pete Seeger talked a lot during performances, some about himself, mostly about the issues. As I read this book, I sang the songs in my head. I think this book will be most appreciated by older kids, and adults, but particularly people who know the songs. If readers/listeners are not familiar with the songs, they should be played in order to better understand the man and this book. There are more resources in the back and I will be checking them out! This book didn’t quite give me the Pete Seeger fix that I needed. Perhaps a longer biography would, but I suspect it’s only his songs that will do the trick. Thank goodness for them, and for my memories of their context. I’m sad that there will be no more. We really need him NOW. I’d love so much to hear some new songs by him about the current state of affairs. I know he’d be brilliant and would galvanize me and others to take even more actions than we are now. He was a great man. As I said, this might be a good book for young fans of Pete Seeger (but they MUST know his music) and it’s a great introductory book for would be activists, students of social history and environmental science, etc. Very nicely done biography of Pete Seeger for young readers. Reich handles the blacklisting briefly and in an appropriate way for children although questions will certainly occur to many. There is a nice section on Seeger's work with Dr. Martin Luther King and the signature ballad, We Shall Overcome. Reich includes Seeger's work on the Clearwater and cleaning up the Hudson River and ends with a wonderful call to continue Seeger's work. Adam Gustavson's gouache, watercolor and pencil illustrations Very nicely done biography of Pete Seeger for young readers. Reich handles the blacklisting briefly and in an appropriate way for children although questions will certainly occur to many. There is a nice section on Seeger's work with Dr. Martin Luther King and the signature ballad, We Shall Overcome. Reich includes Seeger's work on the Clearwater and cleaning up the Hudson River and ends with a wonderful call to continue Seeger's work. I'd heard of Pete Seeger---of course I had, I'm a child of the sixties---but I really didn't know much about him. Until now. Now I've read this book, and now I have a new hero. What a force for good! Oh my! This is a book you need for your home or school library if you like a powerful story, beautiful illustrations, and a person with a vision for justice. My dad was an immigrant who loved music, and when he arrived in this country, he discovered all kinds of American music that he had never enough of heard in Wales. He often played Jazz, Gospel, and Folk Music, and one of his favorite musicians folk artists was Pete Seeger. In this picture book biography for older readers, Susanna Reich introduces them to the life and music of Pete Seeger, a man who was born to play the banjo and sing the songs he wrote. As a boy, Pete spent the winter at boardin My dad was an immigrant who loved music, and when he arrived in this country, he discovered all kinds of American music that he had never enough of heard in Wales. He often played Jazz, Gospel, and Folk Music, and one of his favorite musicians folk artists was Pete Seeger. In this picture book biography for older readers, Susanna Reich introduces them to the life and music of Pete Seeger, a man who was born to play the banjo and sing the songs he wrote. As a boy, Pete spent the winter at boarding school, and the summer living with his dad and brothers in his grandparents’ barn. There he played in the woods, played music and read books. After reading about how some Native American tribes believed that everything should be equally shared among its members, Pete decided that was the way he wanted to live, too. Later, living in New York City during the Great Depression, Pete was further influenced by the workers’ rights protest songs that he heard at parties, concerts, and parades he and his dad participated in. Pete’s family may not have had much money in those days, but, thanks to Pete, they did have plenty of music - spirituals, work songs, dance tunes, games, songs, lullabies, love songs, ballads, field hollers, blues, and even chain-gang chants. For a while, Pete was allowed to tag along with Woody Guthrie as he toured the county singing his songs. Pete also began performing with a group called the Almanac Singers, feeling good be able to make a difference in the world. Later, performing with Woody and Paul Robeson, a African American singer, Pete realized that the life as a singer wasn’t easy and could also be dangerous, but one thing he learned from this experiences was that music could calm a angry crowd. Not long after joining another group of folk singers, the Weavers, they were blacklisted for not being “loyal Americans” and could no longer find any work. Eventually, however, Pete met Dr. Martin Luther King, Jr. who was so influenced by his song “We Shall Overcome,” that it became one of the most important songs of the Civil Rights Movement. And that was just the beginning of Pete’s work as a social activist, writing songs that protested the Vietnam War and and eventually, working to clean up his beloved Hudson River. Stand Up and Sing! is an engagingly written biography about one of America’s most gifted and influential activists who courageously used his music to inspire so many people into action. I particularly enjoyed reading Pete Seeger’s biography because he was such a big part of my childhood, yet I knew very little about his personal life, other than the word’s to his songs, all of which I still know by heart. And as Reich shows us, Pete was a man who never wavered in his principles or his dedication to music. I'd say that those are pretty admirable traits. Adam Gustavson’s illustrations, done using gouache, watercolor, color pencil and oil paint, are as soft and gentle as a Pete Seeger song, yet they too say so much. Complimenting the full color illustrations are spot back and white drawing that extend the narrative of this brave, talented man’s life. Pete Seeger may seem a little on the old fashioned side to today’s music listeners, but in fact, he sang a message that is probably needed as much in today’s world as it was in his own time. I've never heard of Pete Seeger before now (though I'm sure I've been unconsciously aware of his music and influence), but this picture book biography has made me want to learn more. And isn't that the point? Some great information in this book. I learned a lot about Pete! We need books like this to reminds ourselves, and to teach our children that change is possible. We can't afford to repeat history--we need to fight for peace, compassion and equality. Pete was an admirable man; the kind of person that stuck to his beliefs; always tried to do the right thing and stood up fo This was such a great story. I actually had no idea who Pete Seeger was until I read this book. Folk isn't a genre of music I actively seek out, but if someone's performing it somewhere or I happen to stumble upon a video I'll listen if it grabs my attention enough. And it was nice to experience Pete Seeger's journey in music and how he was able to touch hearts and inspire. Over his long life (he lived to be 94), Seeger never stopped playing to crowds gathered to protest injustice of any kind. His was a unique kind of “nonviolent” protesting; he used his words and music on his five-string banjo to convey workers’ rights issues, the need for civil rights for blacks, objections to the Vietnam War, and respect for the environment, inter alia. Seeger was investigated, censored, and blacklisted, but still he persisted. “We Shall Overcome,” an old gospel song, became one of the key songs of the Civil Rights Movement thanks to Seeger. The author, in a note at the end of this book, relates that she grew up in a situation much like that of Pete Seeger: among other similarities, their families had traditions of political activism, and one parent was a professional musicologist. She heard Seeger perform many times, and was greatly influenced by him. “As I researched this book, I came to understand why Pete saw himself as a link in a chain. It’s a chain in which music and social responsibility are intertwined, one that began long before he was born and will continue now that he’s gone. This book is meant to be a link in that chain. I loved the illustrations by award-winning illustrator Adam Gustavson, who uses digitized gouache, watercolor, pencil, and oil paintings to portray scenes from Seeger’s life. Evaluation: This is an excellent introduction to the life of someone today’s kids may not know, but should. His songs continue to permeate popular culture, and to encourage a new generation of performers to become politically engaged. Stand Up and Sing! : Pete Seeger, Folk Music, and the Path to Justice is one of two recent picture books devoted to the legendary folk singer Pete Seeger. Seeger is worthy of treatment in picture book form: We want young people to know about him! Stand Up and Sing! accomplishes the goal of familiarizing readers with Seeger’s role in important social movements during his lifetime. The book also explains how folk music is different from other popular song forms. The text has a pleasant straightforw Stand Up and Sing! : Pete Seeger, Folk Music, and the Path to Justice is one of two recent picture books devoted to the legendary folk singer Pete Seeger. Seeger is worthy of treatment in picture book form: We want young people to know about him! Stand Up and Sing! accomplishes the goal of familiarizing readers with Seeger’s role in important social movements during his lifetime. The book also explains how folk music is different from other popular song forms. The text has a pleasant straightforward voice, but it isn’t particularly engaging. It would benefit from a hook or two. I also wonder about the organizational structure. The narrative begins with an adult Seeger on stage, then goes back to his childhood, but it never returns to that frame established at the beginning. It just sort of wanders chronologically. Stand Up and Sing! delivers what it promises, but it’s unlikely to become a favorite for most readers. 4.25 Stars I have wanted to read this book since July 2017! Waiting and waiting and we finally got it from another library! I have met his Niece in Law (Laura Vaccarro Seeger) and it was just a step to feel connected. Very interesting book. It is really for 5th - 8th. Yes, I think picture books in a middle school class is PERFECT. You learn the material, civil rights, etc and you get pictures instead of a boring blah blah blah. Isn't that what those camera projectors are for. so it isn't a "ok 4.25 Stars I have wanted to read this book since July 2017! Waiting and waiting and we finally got it from another library! I have met his Niece in Law (Laura Vaccarro Seeger) and it was just a step to feel connected. Very interesting book. It is really for 5th - 8th. Yes, I think picture books in a middle school class is PERFECT. You learn the material, civil rights, etc and you get pictures instead of a boring blah blah blah. Isn't that what those camera projectors are for. so it isn't a "okay 13 year old let's sit around and listen to a story like we are in preschool" It can be like a slide show! It makes me want to youtube some of the songs. Reich, Susanna Stand Up and Sing: Pete Seeger, illustrated by Adam Gustavson. PICTURE BOOK. NON-FICTION. Bloomsbury, 2017. $18. Pete Seeger was born in 1919, lived through two world wars, sang during the Civil Rights Movement, and greeted Barack Obama when he became the President of the United States. Through all of his life, he was compelled to follow the music and use it to express his hopes, his dreams, and his disappointments in the injustices all around him. 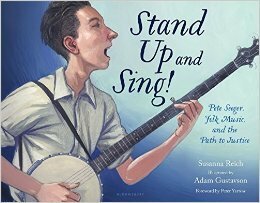 Reich’s biographical sketch and Gu Reich, Susanna Stand Up and Sing: Pete Seeger, illustrated by Adam Gustavson. PICTURE BOOK. NON-FICTION. Bloomsbury, 2017. $18. Reich’s biographical sketch and Gustavson’s beautiful illustrations weave together a look at an important folk singer and shows the power of music to move people. A great book for a music class, a history class, or as a biography source. A more detailed picture book about the life of Pete Seeger than Listen: How Pete Seeger Got America Singing but just as well-written. Includes his childhood, attending boarding school and getting his first banjo from his mother. The illustrations are beautiful gouache/watercolor/colored pencil. I liked that the book also included two actual photographs of Seeger. I think this could be hard for kids to appreciate fully without a lot of historical context (around the Depression, labor movements, WWII, HUAC, the Civil Rights Movement, and the Vietnam War). The book sacrifices providing some of that context in covering Seeger's whole life and choosing to really present him as a link in a chain extending in both directions. That point of view seems intentional and consistent with him, though, so I don't think it was a poor choice. The illustrations are in a va I think this could be hard for kids to appreciate fully without a lot of historical context (around the Depression, labor movements, WWII, HUAC, the Civil Rights Movement, and the Vietnam War). The book sacrifices providing some of that context in covering Seeger's whole life and choosing to really present him as a link in a chain extending in both directions. That point of view seems intentional and consistent with him, though, so I don't think it was a poor choice. Stand Up and Sing is long for reading aloud. Touches on many points in American history--Great Depression, World War II, McCarthyism, Civil Rights Movement, Vietnam, and modern environmental movement. Would be good supporting text for an upper elementary/middle school American history class, but hard in this format to provide enough info about all of the topics it touches to stand alone. This is a fine sketch of Seeger's life and influence, and incorporates his connections with towering figures like Woody Guthrie, Martin Luther King, Jr., and contributing to the Civil Rights Movement. Gustavson's very expressive hand and eye make the book a satisfying visual experience too. Makes me wonder what the 45th president would have brought out in Seeger's music and activism. Pete Seeger used folk music to unite people, to calm people, to inspire people, and to lead people. His music-making spanned the Depression into the 70s. To be reviewed this week at A Year of Reading.